at 1:57 PM 59 Comments Topics: Blog. In honor of my friend Shannon's birthday and her love for all things owls, I made her special cupcakes! This creation is in a book called Hello Cupcake that my friend's mom showed me. It has so many ideas for fun cupcakes! All you need are Oreos, M&Ms and your basic cake mix and frosting. Prepare your cupcakes like you usually would and frost them, too. I use a frosting recipe that my mother in law gave to me. It might be super secret so I won't share it here. But, I'll just tell you it's delicious! It helps to shape the frosting so it looks like an owl's head. And coloring it is fun, too! Once your cupcakes are frosted, place 2 Oreo halves with cream filling on the cupcake. This requires 2 Oreos, so you'll have 2 nonfrosted cookies for every cupcake you make. The leftover cookies are to do with whatever you choose. . . . .
Next put 2 M&Ms of any color on the Oreos, these are the eyes. Then place an orange M&M vertically in between the Oreos and VIOLA! Owl cupcakes! at 9:25 PM 5 Comments Topics: Blog., Recipes. at 9:11 PM 0 Comments Topics: Blog., Handy Tips. I have been doing some organizing around the house. I find a lot of my ideas from Pinterest and my Better Homes & Gardens and All You magazines. Every time I look around the house, I think, "How can I make that look put together?" So, here is a gallery of various organization I've done at home. Used old toilet paper rolls to organize cords. Tidied up the "junk drawer" with a drawer organizer ($3 at Walmart). Ahhh so much better! Used a Mason jar to store cupcake liners. Organized our bathroom shelves with baskets. Put this small cabinet (that I bought at a flea market a few years ago) in the awkward kitchen corner with our calendar, white board and photos of our friends. This is our little message center :) That basket in the bottom right holds any loose paper we have. Rather than throwing it away, Mike takes it to work and shreds it, which is then recycled. . . just doing our part! Each drawer of the cabinet holds the stuff that used to be in a basket on the counter - this frees up counter space! I feel so much better having the little stuff taken care of and ORGANIZED! I even went and bought 2 more plastic bins at ACE today to store off-season clothes and shoes. I'm out of control! 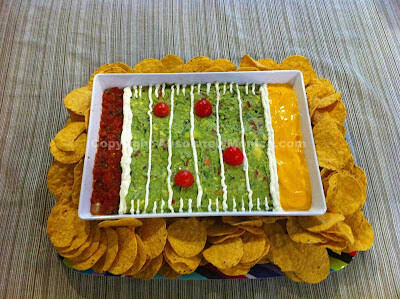 Oh, and for your information, I am making this tomorrow for the Super Bowl! I'm so excited! at 5:01 PM 0 Comments Topics: Blog., Organization. at 8:50 PM 0 Comments Topics: Blog., Mike Meter, Recipes.